On PrestaShop 1.5, you no longer get to upload an image at the same time as you create the product. This is a change compared to versions 1.0 to 1.4. You have to create the product first with its basic information such as name, and then you upload an image. 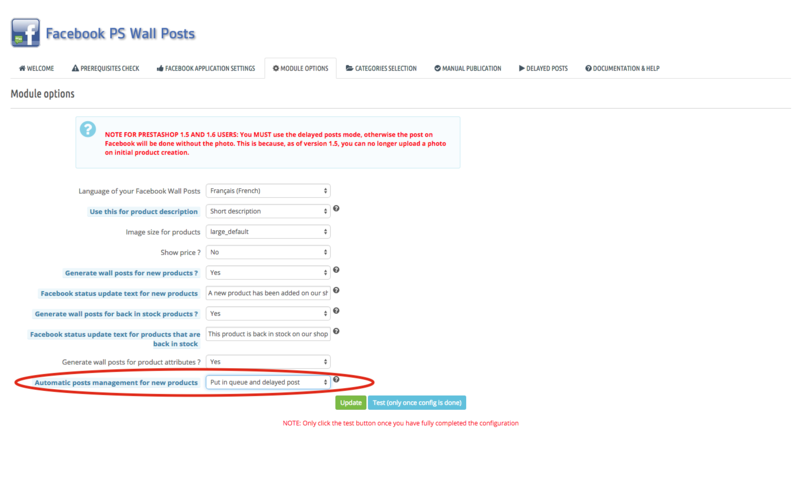 For that reason, the module cannot work correctly if you use "Post on product creation" for the "Automatic posts management for new products" setting. You have to use the "Put in queue and delayed posts" option. Otherwise, because the module executes itself on the "newProduct" hook and is only executed when you FIRST click the "Save" button, the product will not have an image and will not post correctly. When you choose that mode, all the products will be queued in the "Delayed posts" tab of the module. Once all your product sheets are completed and active, with photo and all appropriate data, you can go to the "Delayed posts" tab and post all or some of your products in just one click. You'll want to make sure the product status is not on "Disabled". Otherwise the product will not be posted. In the module's configuration, go to the "Categories selection" tab, and make sure all the adequate categories are checked.